Kidderminster Harriers ran out 4-0 winners tonight at the expense of a very youthful and inexperienced Crewe Alexandra side being watched by legendary Alex boss Dario Gradi. A first goal in Harriers colours for Nick Wright (right), Charlie Bird (believed to actually be Chad Bond from Swansea City) and goals for John Finnigan and Tom Shaw sealed an easy victory for the Harriers. Despite the side looking more like the one that will step out against York City in less than a fortnights time there were spaces in the side for trialists Henry Eze who had a poor game but dominated in the air and for Bird who capitalised by scoring. Paul McCone also started to top off the trialist contingent. 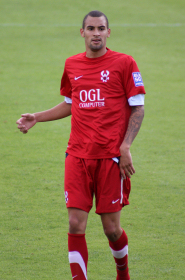 The game was dominated by the Harriers and the first goal came eleven minutes after kickoff when a pass was played inside by Matt Blair who knocked the ball to Wright who took three attempts to get it into the Crewe goal but succeeded eventually when he hit the ball past Polish goalkeeper Bartek Fogler. Within fifteen minutes the lead had doubled and the goals were flowing as Kyle Hadley ran in from the right wing and played a ball to Bird who came forward to meet the ball with a deft flick past the flailing Fogler. Hadley nearly turned scorer instead of provider with a surging run and a thumping drive which was almost like watching JJ Melligan against Cambridge all those years ago, however he wasn't as lucky as the current Cheltenham player as he hit the upright and the ball fizzed away towards the refreshments at the away end. Still the threat remained for the Harriers and as Bird flew (oh dear) into the area to collect a pass he was floored by a Crewe defender and Finnigan took the penalty with power as it was driven high into the roof of the net, making it un-saveable for the goalkeeper. In the second half the Harriers still threatened and this was typified by Tom Shaw's goal in the sixty eighth minute when Nick Wrights' shot was palmed away by Fogler but the rebound fell to Shaw and a toe's inch meant that he could poke the ball into the net in front of the Town End to thoroughly put the game beyond doubt. There were plenty of other chances, for Lee Morris amongst others, but the game finished 4-0 to the Harriers. The victory was definitely a good, positive result and for once Gary Whild can say we played well and mean it. We took apart Crewe time and time again and a Mike Williams run was a prime example of this as he ran down the left and was unlucky not to see his Messi-esque run end with a goal as it was blocked on the line. Dave Hankin looked impressive, Wright superb and Bird promising. The side that Crewe put out may've been inexperienced but they will be to the standard that other Conference teams will be next season, for the first time this close season we look to be going somewhere. Andrew Stevens, Henry Eze (Tom Sharpe), Aaron Griffths (Mike Williams), John Finnigan (Tom Shaw), Mark Albrighton (Michael Briscoe), Jack Byrne, Paul McCone (Lee Vaughan), Kyle Hadley (Dave Hankin), Matty Blair (Callum Gittings), Charlie Bird (Lee Morris), Nick Wright (Robert Thompson-Brown). Bartek Fogler, Danny Shelley (Kelvin Mellor), Andy White (Ollie Turton), Matt Mitchell-King, Adam Dugdale, Harry Davis, Byron Moore, Danny Maguire, Jimmy McCarthy (Jordan Connerton), Antoni Sarcevic, Ajay Leitch-Smith (Joel Grant).